Explanation: Is gravity the same over the surface of the Earth? No -- it turns out that in some places you will feel slightly heavier than others. 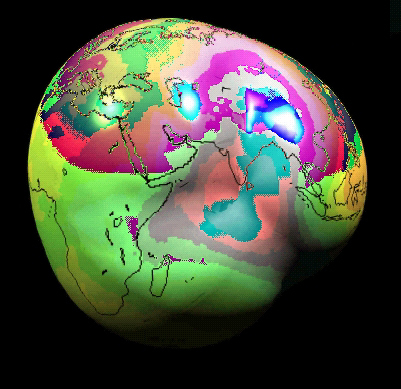 The above relief map shows in exaggerated highs and lows where the gravitational field of Earth is relatively strong and weak. A low spot can be seen just off the coast of India, while a relative high occurs in the South Pacific Ocean. The cause of these irregularities is unknown since present surface features do not appear dominant. 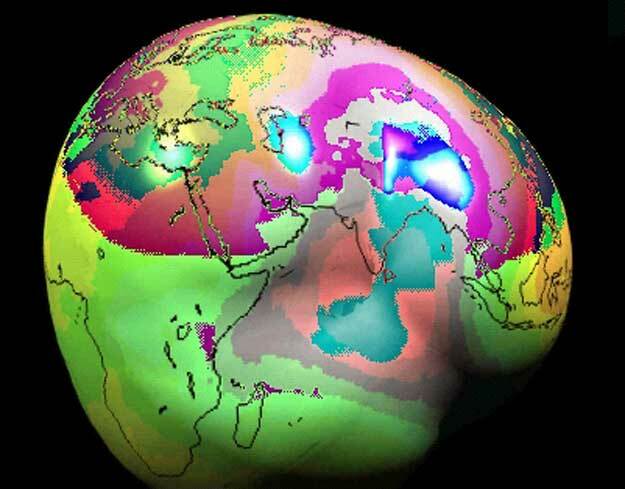 Scientists hypothesize that factors that are more important lay in deep underground structures and may be related to the Earth's appearance in the distant past. To better map Earth's gravity and hence better understand its interior and past, NASA plans to launch the Gravity Recovery and Climate (GRACE) satellite in February.